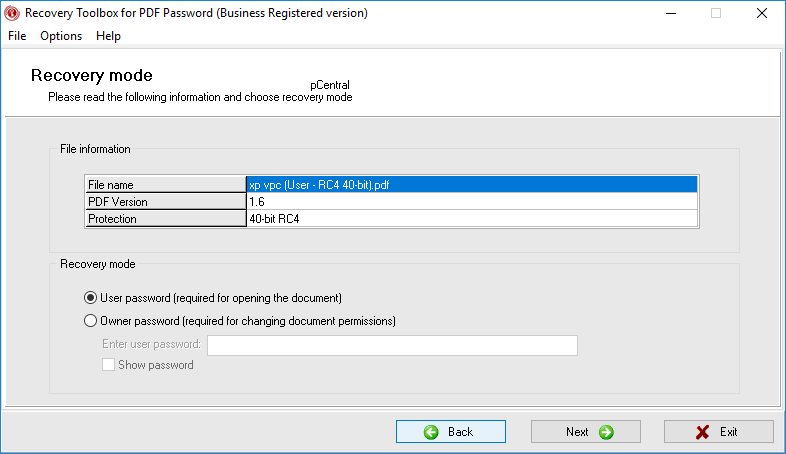 As simple and intuitive as Recovery Toolbox for PDF Password (Download) may seem, it still requires configuration according to the recovery mode selected - and this process may be quite confusing for first-time users. Please make sure you have read and understood this usage manual prior to contacting our support department. The document below contains a comprehensive description of every feature found in the program and the basics of its operation. 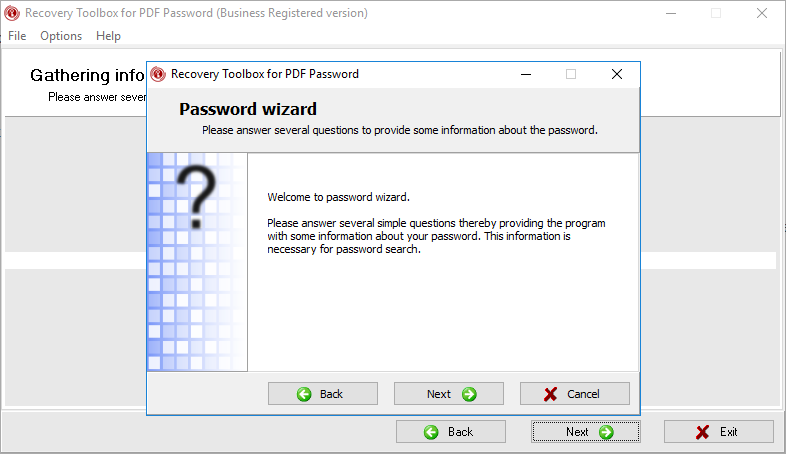 Recovery Toolbox for PDF Password is a step-by-step wizard that guides you through the process and requires a minimum of efforts on your end. However, due to the rather complex nature of password reconstruction, this wizard is more complicated than the ones used in other Recovery Toolbox and therefore requires a more detailed description of its options. The general rule of thumb is to follow on-screen instructions, complete the necessary actions and press the Next button to proceed to the next step of the wizard. You can always go back using the Back button to change settings or choose another file for password reconstruction. 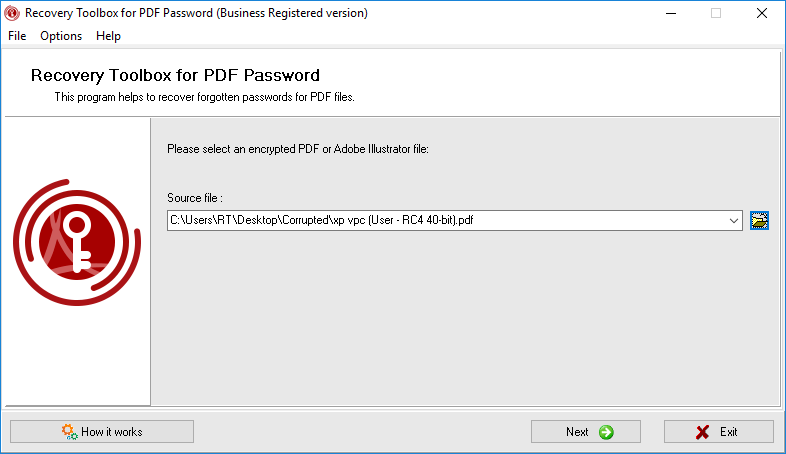 REMEMBER: Recovery Toolbox for PDF Password will hardly help you(within a reasonable time frame) if you don't know anything about the password you are trying to recover. This tool is intended for reconstructing partially known passwords, so it is initially assumed that you know at least one of its parts or most of it, but are not sure about a few characters. Apparently, the more you know about the password, the faster and more hassle-free the process will be. Use this command to quit the program. Attaches the currently opened file to a new message created in the default mail program. Please note that the default email client must be defined in the system for this function to work properly. IMPORTANT: When submitting a password-protected file to the program developers, make sure to include EACH AND EVERY known detail about the password in question. This will GREATLY facilitate the work of our experts. Clears the list of previously used source files. Multi-threading. This option defines how your CPU is utilized by the program. When the option is set to Auto-detect, the program automatically detects available logical CPU cores and uses them for calculations. You can also uncheck the automatic detection option and limit the number of cores used by manually specifying the necessary number in the corresponding field. This setting is enabled by default. Use mask constructor instead of password wizard. The use of a mask constructor instead of the regular wizard gives you a lot more flexibility and control over the password reconstruction process, but requires a good understanding of the password structure and brute force password attacks. Use this option if you feel confident in what you are doing and believe that manual configuration of the password recovery engine will speed things up. This setting is disabled by default. The difference between these two operating modes will be explained in detail below. The Help section contains links to the program's help section, its website, the order page, the program registration dialog and the program information page. Unlike the majority of other document types, PDF files can be protected with two passwords at the same time: User Password and Owner Password. The user password is intended for opening and decrypting the content of a PDF file. The owner password is a lower-level password that enables you to edit the access permissions of a document (for instance, to allow copying of the document content to the clipboard). The oldest one. Uses RC4 encryption with a 40-bit key for content protection. An improved version of R2 with a 128-bit key. A newer generation of the protection system using a 128-bit AES algorithm. The most recent version using 256-bit AES encryption. PDF files contain hashes of both passwords that are used for quick password validation. Recovery Toolbox for PDF Password uses theses hash values for recovering passwords. 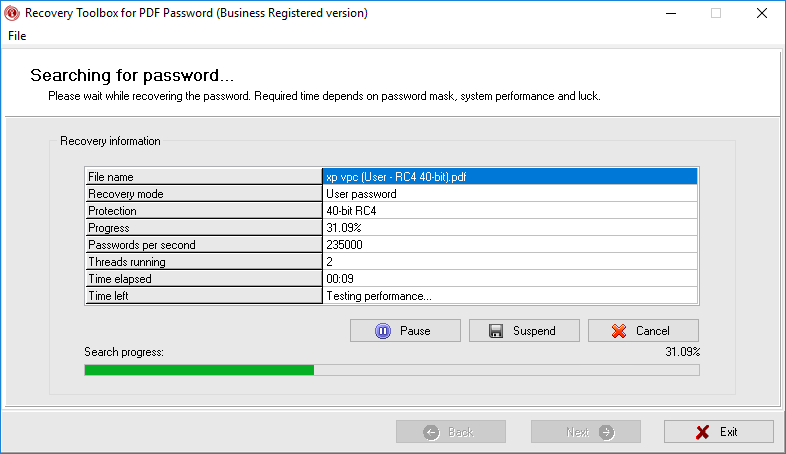 R5 passwords are the easiest to recover, despite the fact that it's the latest version of the protection system. R2 passwords take a bit longer to recover, while R3 and R4 passwords take incomparably (dozens of times) longer to find. The password recovery process is identical for both modes, except for Step 2. The differences will be explained below. The first step allows you to specify the file you want to recover a password for. This can be done in three ways. You can simply type its name and path into the input field located in the center of the program window or use the standard Windows open file dialog. You can also choose a previously used PDF file from the dropdown list that can be opened by clicking a small button with a downward arrow in the right part of the input field. Once you've entered the file name, you can proceed to the next step by clicking the Next button at the bottom of the window. At this step, the program displays basic information about the file (file name, PDF version and version of protection used) and prompts you to select the recovery mode - that is, select the password that will be recovered. As explained above, it's either the user password or the owner password. If you want to restore the owner password for a file using earlier versions of the protection system (R2-R4), you will need to enter the user password as well (if it is set for this document),sincetheyarecloselyinterconnected. Check the Show password option to see the password as you type it. The password recovery wizard is a questionnaire that helps you define known or nearly known parts of the password and narrow down the search range to minimize the password reconstruction time. The wizard enables you to break the password into several parts and characterize each part as known or unknown. Each part must be something you can or cannot remember. For instance, if you know that the password starts with John and ends with something else, you should break the password into two parts. The program will ask you to enter each of the known parts. The password element entry screen also lets you specify whether the entered part contains characters in the right case or not (the ...but I am not sure about the letter cases option). The option works for Latin characters only. For unknown parts, the user can specify the characters that it may contain (small and capital Latin characters, numbers, special characters, spaces) and their length. Apparently, the shorter their length is, the faster the program will be able to calculate and try all possible combinations, so always try to use the narrowest range possible. You can choose one of the predefined range values, set your own range (I can set the length range myself) or - best of all - specify the exact length value (I remember this part length exactly). Once you are done describing the password parts, click Close to close the sub-wizard and go back to the current step. Once there, click Next to proceed to the next step of the wizard. 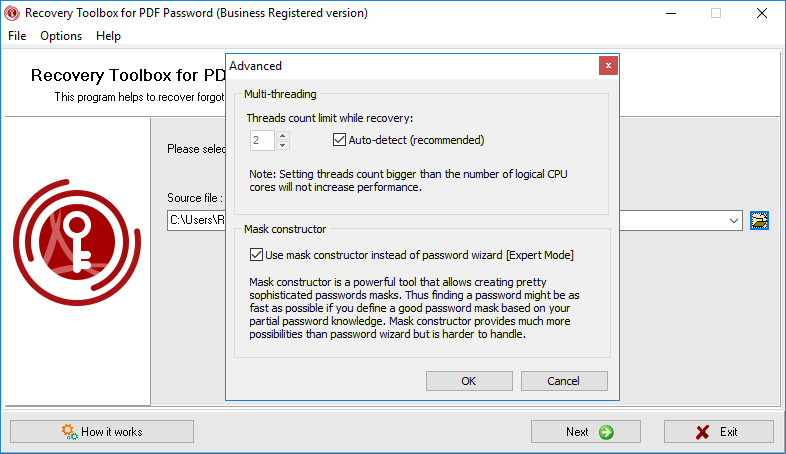 The Mask Constructor mode allows you to configure the same recovery settings as in the Password Wizard mode, but provides a lot more flexibility and control over the process. In this mode, the password can be composed of as many as 6 parts that are represented by 6 elements displayed on the mask construction screen. Parts can be swapped and dragged into any position using the mouse. You can click each element representing a part of the password to modify its parameters. Unused elements will be ignored during the password generation process. The value of each part can be either Mostly unknown, A well-known text value or Some value from list. For a Mostly unknown part type, users can specify the character types (or specific characters) it can be comprised of and its length. For A well-known text value part type, you can enter a specific text value for this password part and specify whether character cases may vary by checking a corresponding option. Finally, a Some value from list part type contains a user-defined list of possible values. Values can also be loaded from a text file. For each of the above password part types, you can enable the ...and this part may also be absent option, which will allow the program to skip it altogether while generating possible character sequences. A general list of instructions on using this feature is available on the Password Mask Constructor page. Once the password reconstruction template has been defined either in the Password Wizard or Mask Constructor mode, the actual password generation process starts. By default, the software uses all available CPU resources (cores) for calculating hash values, which may affect the performance of the system and render other programs nearly or completely unusable. To limit the use of your computer's resources, use the Multi-threading option in the Options – Advanced menu. the name of the PDF file. the type of password being recovered. the type of password protection system used in the file (according to Adobe's definition). a per cent value of the current password recovery progress. an estimated number of passwords generated by the program per second. the number of logical CPU cores used involved in the calculation process. the duration of the process. the estimated time till the end of the process. To calculate this value, the program uses statistical data about the password generation speed over the last 5 minutes. However, this value will not be displayed until 30 seconds have passed since the start of the process. Instead, the program will display a note about performance testing. Password recovery may last hours and even days, depending on the length of the password, the characters used in it, the number of known characters, the speed of your computer and other factors. This is exactly why we made it possible to temporarily stop the process, save the progress and resume the work of the program in the future without losing the results of previous calculations. The state of the password generation process is saved individually for each file every 10 seconds. It's also saved whenever the Pause and Suspend buttons are pressed or the program is closed using the Exit command or by closing the program window. You can restart your system, shut it down and do whatever you need, even move the file to another drive - the current progress value will not be lost, since it's associated with this specific file using unique file identifiers. However, if you press Cancel or the program fails to find the password in the Password Wizard mode, the progress value will be reset and you will have to start all over again next time you load the same file. Notethatafailuretoreconstructapasswordafter the completion of a password reconstruction session will always mean one thing - insufficient or incorrect input data. There are no other reasons that may affect the chance of success in this case, so it may be a good idea to revise the recovery options and try again if Recovery Toolbox for PDF Password fails to reconstruct a password. Unlike the full version, the demo version of the program displays 3 initial characters of the password only. If the program fails to recover the password, it will show a corresponding notification.